Who, me? I’m innocent. Really. My Bloodhound ate my bra. Chewed a hole right through it. Luckily, the hole is at the top of the right cup, and the bra is still wearable. (What was she thinking? Nylon smells nothing like dog cookies!). The point is, this used to be my BEST bra. It wasn’t my usual outlet-mall-discount-rack-$5.99 special. I shelled out serious money to buy it: A super-converter bra, strapless, backless, cross-back. All equally supportive thanks to its advanced architecture, underwire, and the little rubber skin grippers that may have been engineered by NASA and used on the Mars Rover. This is a seriously great bra. You wouldn’t even think hey, she’s wearing a bra in this picture. Darn it! But I’m not tossing the bra (yet). I paid too much. Plus, what are the chances of finding a second one just like it? Shoot, I’d even settle for something similar. In the meantime, fixing the hole in is an option. Wearing tissue-thin T’s over a Franken-bra is not. My black James Perse razor-back is out of the question. So I’m thinking layering… I’m thinking sweaters… and fabrics that don’t require perfectly smooth cups beneath… I’m thinking of the outlet mall. Because maybe, just maybe, I’ll get lucky and find a Super-Bra in my size, one that will NEVER EVER see the inside of a laundry basket, or the jaws of a bored Bloodhound. 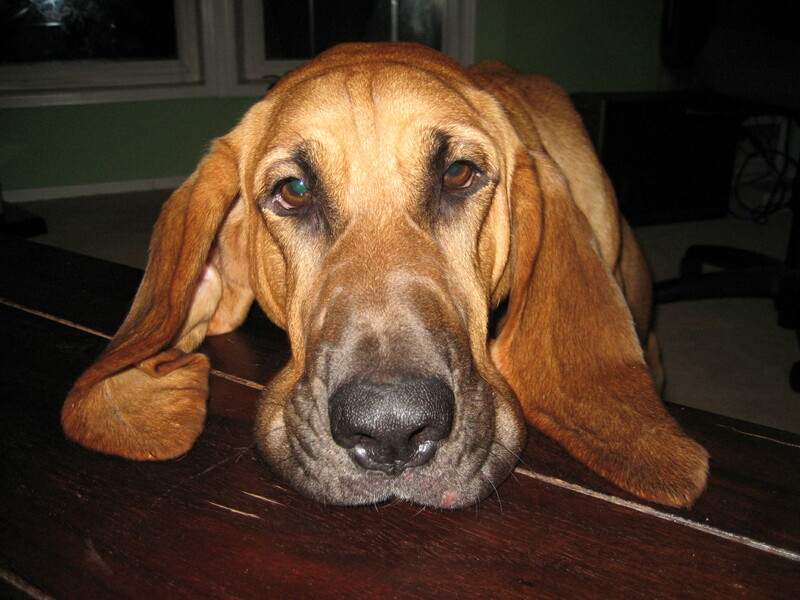 Bloodhounds: Those Long, Long EARS! Is My Bloodhound Secretly Using My Smartphone?